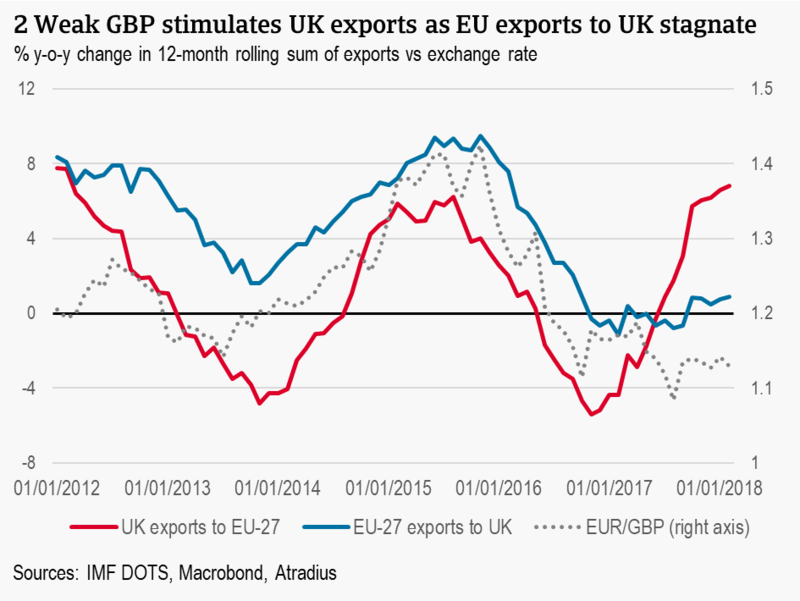 The pound sterling has depreciated substantially against the euro since June 2016, reducing purchasing power in the UK but boosting competitiveness of UK exports. This has already had a significant impact on trade flows between the UK and the rest of the EU: most recent figures show 6.8% growth in UK exports to the rest of the EU but only 0.9% growth the other way around. The exchange rate is expected to stabilise in 2018 and 2019, reducing the boost for UK exports but also easing the strain on EU exporters to the UK. Should negotiations further stall or even break down, renewed downward pressure would be placed on the pound, continuing and possibly worsening these trade effects. With 29 March 2019, the date the United Kingdom officially leaves the EU, quickly approaching, negotiations surrounding the future EU-UK relationship have stalled. While the future trade relationship is not yet clear, there are already significant developments resulting from the Brexit vote that can be observed in trade flows between the UK and the rest of the EU. This update revisits the UK-EU trade relationship to identify trade-related vulnerabilities in Europe. Negative impacts on European exports to the UK are already visible, as the weaker pound sterling and slow GDP growth weigh on demand. On the flipside, the boost to competitiveness the weaker pound brings has pushed UK export growth to the EU to its highest level since early 2012, further supported by robust demand in European markets. Going forward, we do not expect this trend to continue so strongly as exchange rate effects fade. However, lack of progress in the negotiations could renew downward pressure on the pound, continuing to reduce export opportunities to the UK and boost UK exports. The trade relationship between the UK and the EU-27 (the EU excluding UK) is significant. UK goods exports to the rest of the EU comprise 48% of total exports while 16% of exports from the EU, not including intra-EU trade, are directed to the UK. With such large volumes, any barrier to trade – whether in the form of tariffs or longer wait times at the border for instance – can be expected to have a negative impact on trade. The full extent will only become clear when the UK finally leaves the EU in March 2019. The transition period, if confirmed, may extend current arrangements to December 2020 and thus defer impact but the timetable is reliant on further progress in the exit negotiations. However, the effects of the Brexit vote on the exchange rate and subsequently on GDP growth already have an impact on trade. In previous analyses, we identified Ireland, the Netherlands, and Belgium as the most vulnerable economies in terms of export dependence on the UK, while Germany followed by France exports the most to the UK in terms of volume. 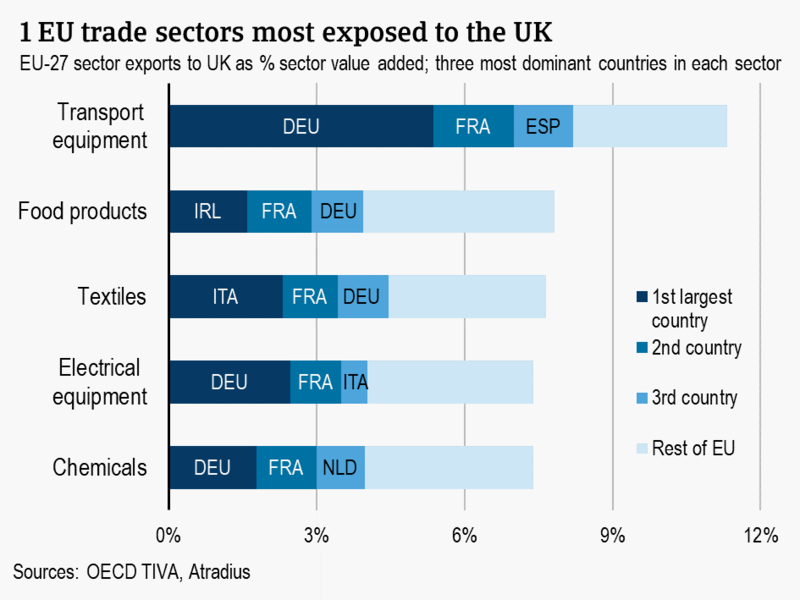 Looking to sectors, the transport equipment sector is the most vulnerable industry in Europe, with exports to the UK accounting for 11.3% of the total sector value added. Food products is the second most exposed sector followed by textiles. The vulnerability of France and Germany is apparent in Figure 1, showing the three most dominant countries in each European export sector. However, the picture of vulnerable countries per sector changes when considering how dependent each national sector is on trade with the UK. While Germany exports the largest value of transport equipment to the UK, 47% of the total, these exports to the UK only account for 10% of the sector’s value added. Belgium’s transport sector, on the other hand, which does not show up in the figure, is the most exposed with UK exports accounting for 28% of value added. More than half of the EU-27 see more than 10% of their transport sector value added derived from UK exports. The most vulnerable countries highlighted above generally see the broadest exposure across sectors as well. Ireland is clearly the most vulnerable country in this respect. Irish exports to the UK account for 44.2% of value added in its manufacturing sector and 40.3% of value added in its food sector. The UK remains a fully-fledged member of the EU until the leave date and no tariffs on trade between the UK and the EU yet apply – accordingly, for now, the overhanging uncertainty aside, it is business as usual. The real impacts on trade will likely emerge in the medium to long term, as the trade relationship actually changes and supply chains are required to adjust. However, there are already some remarkable trends observable in the bilateral trade flows, in line with exchange rate developments. IMF gross figures show a strong acceleration in exports from the UK to the EU-27 since early 2017. In the 12 months leading to February 2018 (most recent figures at time of writing), UK exports to the EU grew 6.8% year-on-year, the highest growth rate seen since February 2012. At the same time, EU exports to the UK flattened since late 2016. This trend since early 2017 is a reversal of the relationship observed in the post global crisis period. From 2011 to 2015, EU exports to UK grew at a faster pace than vice versa. EU exports grew on average 6.4% per year compared to 1.2% growth from the UK. However, following the victory of David Cameron’s Conservative party in the May 2015 UK election, which heralded an imminent in/out referendum, the tides began to turn. These trade developments are in line with exchange rate developments, as demonstrated by the close correlation to export growth in Figure 2. Since mid-2015, the UK currency has been depreciating against the euro and is currently worth more than 12% less than it was in June 2016 prior to the 2016 referendum. Through 2017, this meant that UK products became more competitive in European markets while European products were relatively more expensive for Britons and lost competitiveness in the UK market. This is reinforced by GDP growth developments: the weaker GBP has weakened UK consumer purchasing power weighing on GDP growth through 2017 and reducing import demand. At the same time, EU demand has strengthened robustly on the back of broad-based economic growth. For EU-member states, exports to other EU markets have been growing significantly more strongly than exports to the UK. Most recent figures show 6.8% growth in intra-EU-27 exports compared to only 0.9% EU-27 exports to the UK. Zooming in on the most vulnerable countries: Ireland, the Netherlands and Belgium, alongside Germany, France, and Spain based on the volume of trade, we can generally see the same trend, with the exception of Ireland where a different picture emerges. In late 2015, a downward trend in export growth to the UK began in all of the countries except for Spain where deceleration began sharply in mid-2016. Around the same time in 2016, Belgian exports more or less levelled off and have been reasonably steady since then. In 2017, Germany, Spain, and France experienced contractions in exports to the UK with Belgium’s export growth joining them late in the year. For Germany, Spain, and Belgium, the contractions are concentrated in the chemicals and automobile sectors – the largest export sectors to the UK (there is not yet 2017 sectoral data available for France). For most European markets, agrifood and metals sectors growth has remained steady in the UK market. Ireland is the clear outlier in Europe. In 2017, Irish exports to the UK grew 8%, in spite of the weak sterling and high demand in the EU. Irish exports to other EU members grew only 1.4%. The increase is led most strongly by the chemicals sector. The chemical supply chain across the UK and Ireland vulnerability is highly integrated and as such is not flagged as one of the most vulnerable sectors in terms of value added for the economy. The sector however accounts for the highest share of gross exports from Ireland to the UK, so the 26.5% growth experienced in 2017 has a large impact on the total export growth figure. Steady growth in this sector is expected to continue due to ongoing investment and innovation. Irish food exports to the UK, Ireland’s second most exposed sector in value added terms, rose 7.4% in 2017 as well. The worst performing industry in 2017 was the textiles sector (26.6% of sector’s value added dependent on exports to the UK) which contracted 2.6%. This is more in line with expectations due to imported inflation and the consumer-facing nature of textiles, as opposed to the supply chain integration, which reinforces demand for chemicals and pharmaceutical exports. It is already evident that Brexit will have a significant impact on trade flows within the EU. 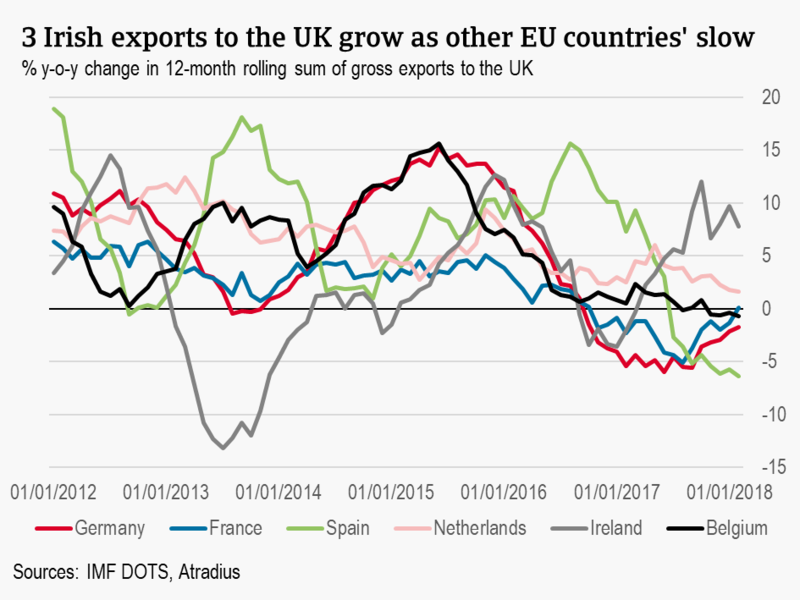 The weaker British pound and its contribution through lower consumer purchasing power on UK GDP growth has depressed import growth from nearly all other EU countries. At the same time, the boost to competitiveness of UK exports also proved to be a factor in 2017. However, it is not clear for how long these exchange rate issues will continue to impact significantly. We expect export growth opportunities to the UK to stay muted in 2018 and 2019, but to slightly improve compared to 2017. This is primarily due to the fading out of sterling depreciation. In 2018 and 2019, the British currency is expected to remain more or less flat, and the boon for UK exports to the EU will therefore weaken in this period. At the same time, the effects of imported inflation will fade out in the UK, improving prospects for EU-27 goods, though relatively weak GDP growth expectations could limit market growth opportunities. In the medium term, export performance into and out of the UK depends greatly on the future trade relationship established. Only a rough framework of a formal arrangement is expected by Brexit day, with the more detailed agreement being further worked out during the transition period – assuming that the period is finally confirmed. Risks to the balanced outlook for the coming years appear adverse in any case. Thus far, exchange rate and GDP movements are reflected in EU-UK trade flows. Sterling volatility increased in the aftermath of the referendum and the currency remains sensitive to the Brexit news flow. Therefore a deadlock or even a breakdown in negotiations could have downside effects on the pound, increasing the challenges for EU-27 exporters. British business insolvencies are expected to rise again in 2018, mainly affecting businesses active in the construction, retail and hospitality sectors.